State of Mind top finished! I always feel so energized after WIP Wednesday. With that and the deadline of a Modern Quilt Guild show and tell tonight I dug into the skyline top (real name to be revealed when it’s done). I clipped it up quickly and took a picture while I had the sunlight (and a sleeping toddler). No time to crop. It actually looks like my original design. The biggest difference is that the original sketch had the view from New Jersey, but this is for a Brooklynite, so I did a Kings County view. I’m really happy with how it’s coming along. ok the whole thing is great BUT you have to know that the different grays on the skyline is genius. it looks like the sun is coming through and hitting different buildings, giving it depth. I hope you run with that…it’s brilliant. Thank you so, so much. It’s the ombre fabric, and I got the last half-yard of grey in existence. I hope it gets reissued. I’m just so inspired by it. Melanie: that quilt is so so handsome! It was wonderful to see it in person! Mr Pop is going to cry when he gets it! Looks great! I really love the background. Very nice! The skyline is especially cool. What kind of quilting are you planning? 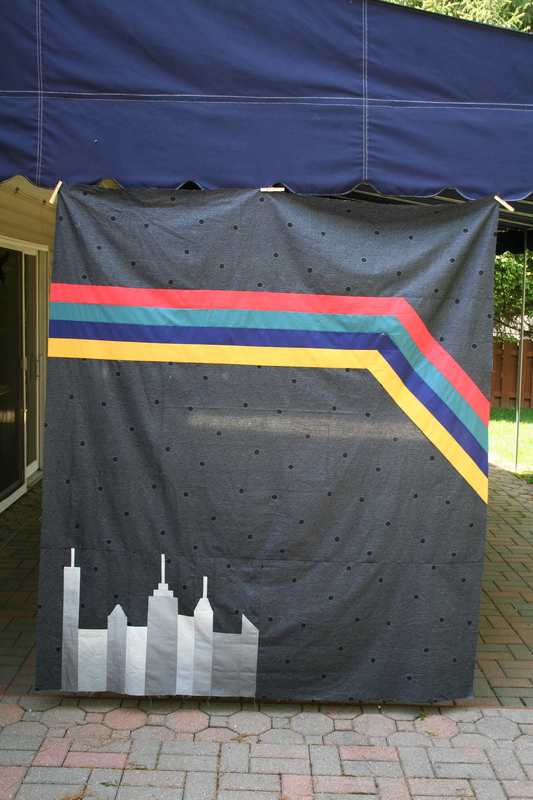 I’m thinking about echo quilting the angles and the skyline, getting creative when they meet. Keeping it masculine and simple to accentuate the design.